Kidlet started Camp Invention this week! He is very excited and has been having a wonderful time. I tear up everytime they send home the paper of activities for the day that states he is in the 4th/5th grade group. Kidlet has a lightbulb of cheese and food color markers on top of a peanut butter sandwich. On the side are grapes, checkered apple, and carrots. I just love these! Of course, I can't draw on paper, much less cheese, so I'm quite envious of your talent. Cute lunch and the camp sounds so fun!! It's so bittersweet these kids growing up! Ethan will be in 3rd grade and that sounds so big to me. Owen will turn seven (7!) soon. Paige is getting so tall and my baby Tyler is trying to walk. Everyone just needs to settle down and stop growing up for a minute!!! 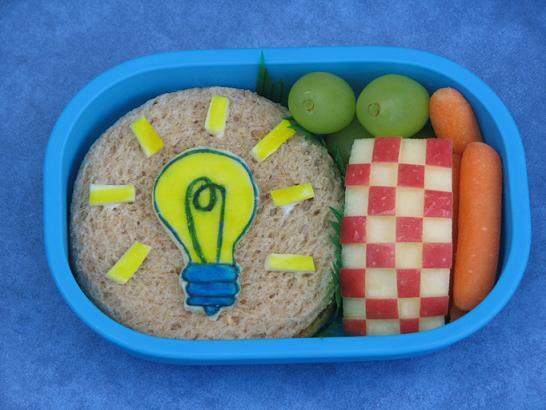 Cute idea for Invention Camp! So cute and awesome creativity! !